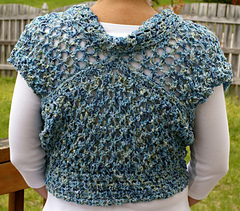 This light, lacy shrug is great for summer nights, when you want a little extra weight around your shoulders but don’t need anything too clingy and warm. 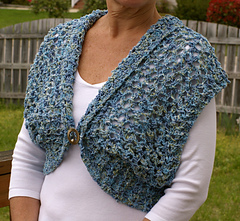 The ribbon yarn gives some interest to the eyelet and mesh stitches, particularly because of the pearlescent variations in the nylon half. 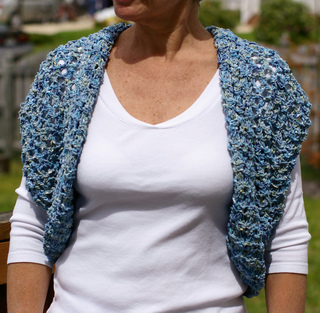 This shrug is called “The Pearl” for the seaside colorway chosen, the fishnet stitch of the main body pattern, for the shimmer of the yarn, and because most of the rows are done in purl. The rectangular base cloth is folded and seamed to form a three dimensional shape without “shaping”, making it a particularly quick pattern to work and wear this summer. The schematic printed very lightly in issue 15. It will be reprinted in 16, and is available on the YF errata page. The author’s pre-edited version is available here in the photos.